Voltage conversion for the standard Advantage Sentra "SK" mold temperature control untis can be undertaken by qualified field technicians. 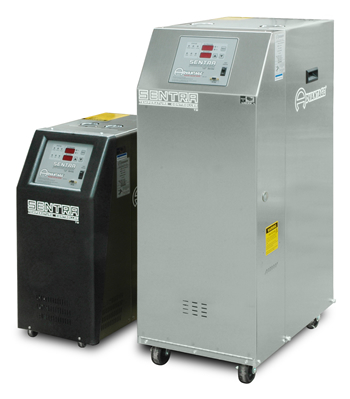 A quallified field technician can convert the voltage on most standard Advantage Sentra "SK" temperature control units. 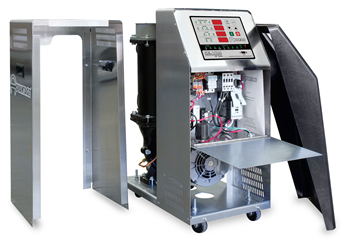 Contact the Advantage Service department with your unit serial number to confirm that your unit can be converted. After confirming that your unit can be converted use this document as a guide to making the voltage change. This document outlines the steps required to change the voltage from 240 to 480 or from 480 to 240 volts for units manufactured after January 1, 2011. Refer to FYI document 1-I-218 for voltage conversion instructions for units manufactured prior to January 1, 2011. Replace unit data tag with tag showing new voltage and amp rating. Sentra series temperature control units. Typical conversions for ½ to 7½ horsepower motors and 10 to 16 kW heaters are shown on this page. Consult the factory for other units. A qualified technician should follow this procedure to complete a field voltage change. Disengage operations. Verify all system pressure is relieved and the unit"s pressure gauges read "0". Disengage main electrical supply. Follow proper lock-out/tag-out procedures. Showing Sentra unit with thermoformed panel removed, lift-off access panel removed and electrical door opened. 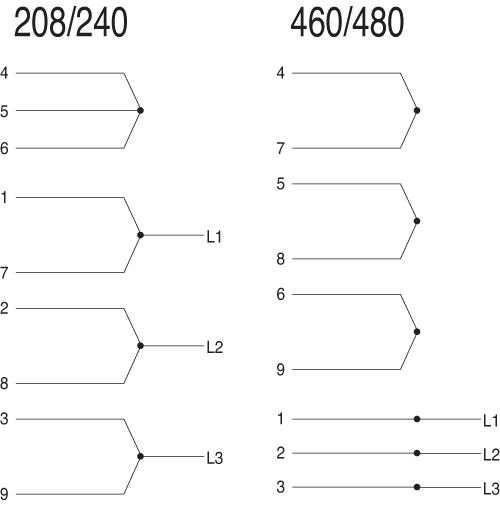 Diagram showing new heater wiring schematic for Sentra units manufactured after January 1, 2011. On some models, remove the thermoformed front panel and open the electrical cabinet panel door. On other models, unplug the instrument connectors to fully extend the hinged panel. Rewire the pump motor for the new voltage.OpenCloseMost Sentra pump motors are dual voltage. Diagram showing new pump wiring schematic for Sentra units manufactured after January 1, 2011. 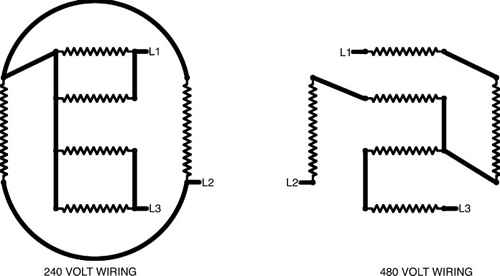 Rewire the transformer to the proper voltage as shown by the schematicOpenClose on the transformer. 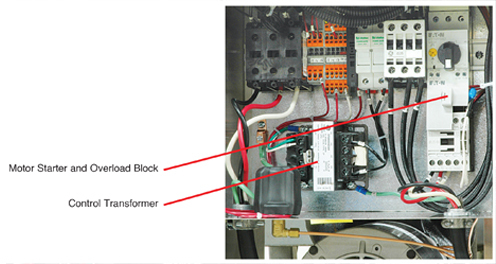 Schematic on transformer showing proper wiring for new voltage for Sentra units manufactured after January 1, 2011. Replace the motor starter and overload block.OpenClose Adjust the overload block settings for the current draw at the new voltage. 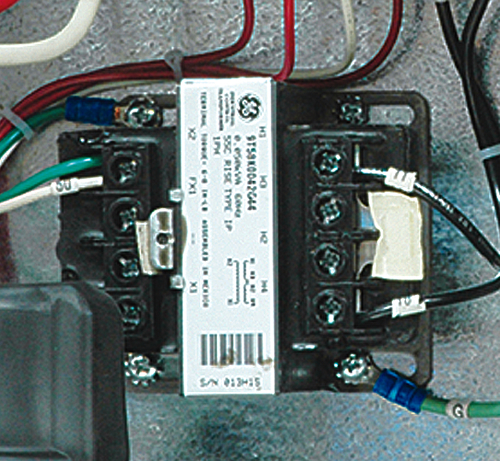 Electrical panel for Sentra units manufactured after January 1, 2011 showing overload and motor starter block. Once a voltage change is complete, be certain the unit is proberly connected to the new voltage supply as outlined in Section 2.5 of the Operations manual. Restart unit operations according to section 3 of the manual. Would you like to Download FYI #311 to your browser?